The total package for a hunting folder with the AXIS lock, the perfect blade size and shape for just about any game cleaning chore, and a folding gut hook that's only there when you want it. Intended for Hunting use, our Grizzly Creek features a folding satin finish gut hook and has a standard clip type with a reversible tip-up clip position. Specifications: Designer: Benchmade | Mechanism: AXIS | Action: Manual-opening | Blade Steel: CPM-S30V (58-60 HRC) | Blade Length: 3.50" (8.89cm) | Blade Thickness: 0.124" (3.15mm) | Open Length: 7.84" (19.91cm) | Closed Length: 4.34" (11.02cm) | Handle Thickness: 0.56" (14.22mm) | Weight: 4.76oz. (134.94g). HIGH-QUALITY: The CPM-S30V stainless steel blade is extremely well-balanced, offering superb edge qualities and rust resistance. The stabilized wood handle is more resistant to environmental hardships than natural wood, making it ideal for hunting. WELL-DESIGNED: Benchmade's AXIS lock is exceptionally strong and fully ambidextrous. The Grizzly Creek is a manual knife that can be opened and closed single-handedly. ALWAYS READY: The Grizzly Creek is the perfect size for a hunting folding knife. The tip-up pocket clip offers ultimate accessibility. MADE FOR HUNTING: The Grizzly Creek 15060-2's drop-point blade is perfect for any game cleaning while the folding gut hook offers versatility when you need it. 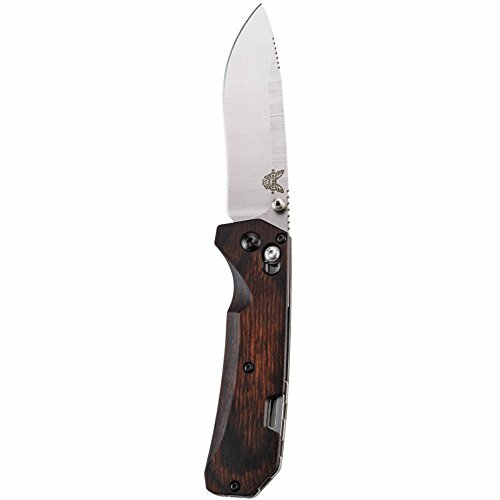 GUARANTEED FOR LIFE: Benchmade's limited Lifetime Warranty and LifeSharp Service keep your knife in the best condition. If your knife needs repair or sharpening, Benchmade will take care of it. Available for knives purchased from an authorized dealer.